This single bedroom apartment has a private entrance, a queen size bed in the bedroom, a hide-a-bed in the living room, a bathroom with spacious shower with towels and bedding included. Fully equipped kitchen. Satellite TV. Washer and dryer. Wireless Internet. Located in a quiet neighborhood in a Cul-de-sac with very little traffic. Off street parking. Beautifully decorated in Southwest decor. Handicapped accessible. We are a retired couple who love the outdoors. We love Blanding because of the variety available in the area. Mountains, desert, lakes, you name it, its here. Plus, we have grandchildren nearby and they keep us young. We built our home in 1980. We raised our family here and now enjoy grandchildren, some of whom live nearby. In 2003 we added our apartment. We originally built it for my sister who had suffered a serious stroke and was confined to a wheelchair. She loved the apartment and lived there until her death. It has since been used by several family members for various lengths of time. We now use to welcome visitors to our beautiful area, and of course for our out-of-town kids (as long as they bring the grandchildren:). We think you will find it welcoming and comfortable. We are usually nearby in case you need anything. The apartment was built with handicapped access in mind. There are no steps and it is ideal for a wheelchair. You will have the apartment to yourselves. The key is located in an entryway lock box. Blanding is appropriately known as the “Basecamp to Adventure." Nearby are national parks, monuments, hiking, biking and ATV trails, museums, hunting, fishing, historic sites and other attractions. Guests are welcome to enjoy the backyard and lawn. Plan to stay a few days. There is much to see and do in our little corner of the world including, national parks, state parks, Navajo Tribal Park, ancient ruins, rock art, museums, hiking, biking, off-road adventure, Lake Powell, historic sites, canyoneering, river running and more. Hosts made homemade muffins for breakfast that were great. We enjoyed our stay! My husband and I stayed 4 nights in this apartment while we explored Natural Bridges NM and Canyonlands NP. 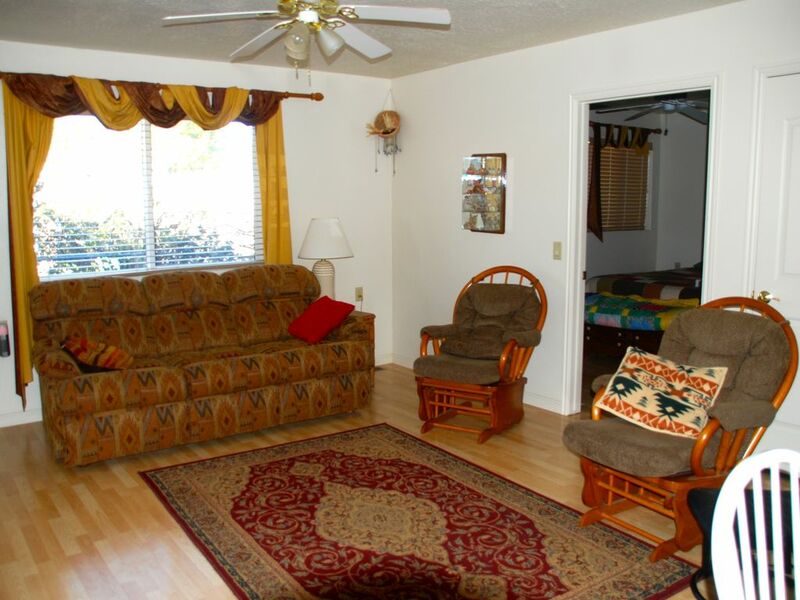 Exceptionally clean, cozy and private. We appreciated being able to do our laundry and cook our evening meals here. Lovely hosts! We would highly recommend this rental. Thanks! Very nice property,very clean and quite, so much to see in the area, we could have stayed longer and still not have seen everything. Would certainly recomend to family and friends.Thank you for a very nice stay. Val & David Gregory, Brisbane Australia. Jed and Candice were great. They made sure I had everything needed for a great stay. The apt was larger than I imagined it would be. It had everything needed for a great stay. Wow! This apartment is a gem. Built as a detached "Mother-in-Law" suite for an aging parent, it's very well designed. Lot's of room to store things. All the appliances work well. It's super clean (not an easy thing in Blanding). Jed and Candace were excellent hosts, kind of like having your best friends living next to you. The bedding was nice and comfortable. Did I say this apartment was extremely clean? Excellent home base for exploring the many wonders in the Cedar Mesa area. Count on spending 4-7 days if you are hikers. There's lots to see. Blanding is appropriately known as the “Basecamp to Adventure." Nearby are national parks, monuments, hiking, biking and ATV trails, museums, hunting, fishing, historic sites and other attractions. Ancient ruins from earlier civilizations are only a short drive away. Blanding is the perfect place from which to see the wonders of San Juan, or just spend the night. There is a pack-n-play fold out crib for your convenience. The back door opens onto a covered patio complete with BBQ grill. Enjoy the fish in the backyard pond while barbequing, and eating dinner on the patio table.